Monaco is named after Monoikos, the Greek for Hercules, who is reputed to have formed the Monaco headland during one of his twelve labours. It has been ruled by the Rainier family since 1297, except for a brief period during the French Revolution, but enjoys a customs union with France. It is a Principality, and is the world's second smallest sovereign state, after the Vatican. Monaco consists of Monacoville, its capital, Monte Carlo, and a small industrial area. 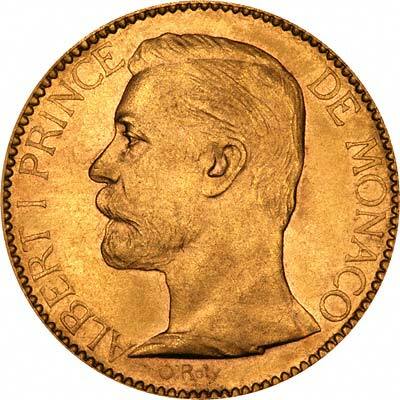 Monaco's coin denominations, their weights and sizes, have closely followed those of France, except that they naturally feature the ruling family of Monaco. 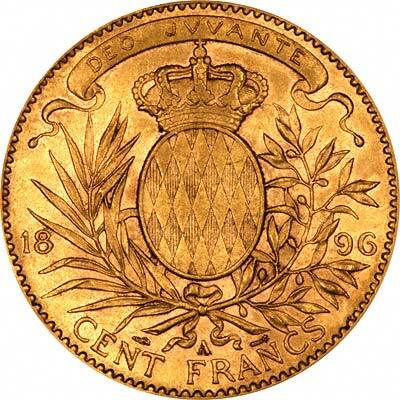 Monagesque gold coins are much scarcer than their French counterparts. For silver and base metal coins of Monaco, please look at our original Chard Coins website. Reverse of 100 Francs of Albert I Prince of Monaco Showing the Motto "Deo Juvante"